Writer Lin-Manuel Miranda boldly reclaims the all-white, founding father narrative for a more contemporary American immigrant landscape – the entire cast barring a single character are played by actors of colour, and a pro-immigrant theme runs through the narrative. In the US, where immigration and non-whiteness are more closely linked, this makes sense. White-instigated, race-based violence is an all too real occurrence, and Miranda challenges that with a diverse cast of high-status characters. This isn’t lost on UK audiences. If anything, the UK being 20% whiter than the US will draw even more attention to the ethnic minority casting. But in Britain a large number of the immigrants are white Europeans, and this population is the primary influence of Leave voters. The concept of ‘non-white’ equalling ‘foreign’ just doesn’t align with the immigrant landscape in the UK. The acceptability of the exceptional immigrant does, though. Stereotypes of working class Polish builders, Bulgarian beggars and hospitality staff from all over the continent are rife in the minds of the British populace. These are the people the xenophobic Leavers want out. They’re happy to keep those they deem more worthy, intelligent or talented. But the underclasses? Oh no, out you go. Miranda’s script focuses on American founding fathers’ remarkable minds, bravery and leadership – but do we see the serving classes in his narrative? Absolutely not. We’re told immigrants get the job done, but here they’re only allowed the most important jobs. Neither do we see women as anything other than devoted albeit politically informed wives, but whose role is solely to serve their husbands and children. Angelica (Rachel John), the strongest woman in the show, is woefully underwritten. It’s disappointing that such historically accurate tropes are followed in a show that is musically inventive. The party infighting, improvisation and sheer stupidity so obvious in the current Brexit negotiations can also be seen as young America establishes its systems. But underlying the nasty betrayals and the title character’s bloodymindedness (played by extraordinary recent graduate Jamael Westman) there’s a cheerful optimism and grassroots scrappiness – everything will be fine! Look at how easy it is to set up a new country! This rose-tints the UK’s present reality, and the tragic ending underscored with hope is plainly visible in the wilfully and woefully blind leading the Leave negotiations. They are fully convinced it will all work out in the end, even though they are clearly wrong. Aaron Burr (Giles Terera), in the fascinating role that straddles both omniscient narrator and the manipulator of Alexander Hamilton’s tragic flaw that leads to a deadly duel, is the closest thing to a voice of reason and anti-fundamentalism. His caution and reserve is a consistent through line, though his insidiousness is perhaps more in line with real life career politicians. He’s a slippery character and the most complex. All of this isn’t to say that Hamilton should have been re-worked for its London run. The creative team is entitled to do what they want, and no doubt Hamil-fans would have been up in arms to see their much loved show changed to be more sensitive to the chaos that Brexit is wreaking on the UK. 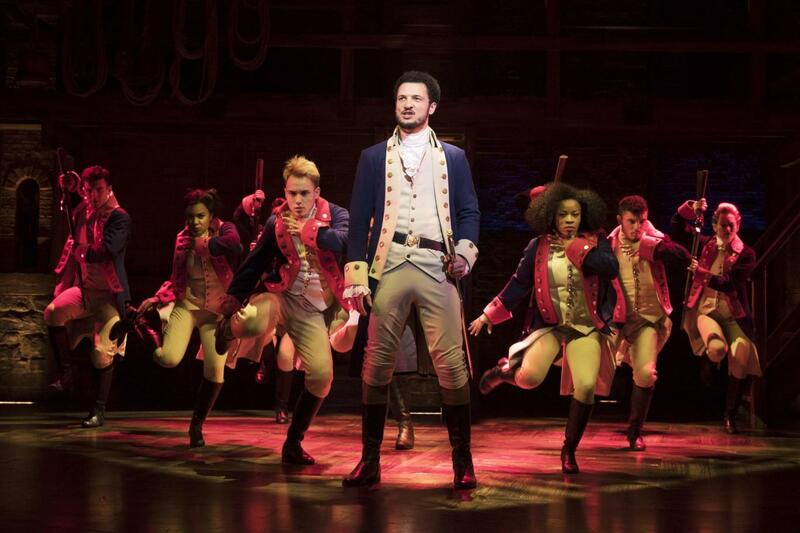 But the parallels between the Leavers’ attitudes and those setting up a new nation in the show give this otherwise wonderful musical a disturbing undercurrent in Britain’s xenophobic climate seeking to purge itself of foreigners. Hamilton runs through 30 June 2018. Crucial difference- Britain’s no longer young, scrappy, and hungry.